Google wants to differentiate from Facebook by offering a lot of ways to export your data. Google Takeout is a feature that's included in Google+, but it's also available as a standalone service. You can use it to export your contacts, Google Buzz messages, Picasa Web photos and Profile data with one click. 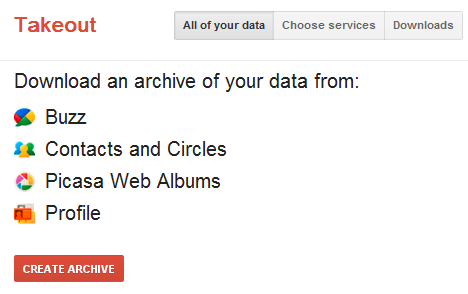 "Google Takeout lets you take your data out of multiple Google products in one fell swoop. Moreover, you’ll find that all your data is in portable and open formats‚ so it's easy to import to other services quickly," mentions the Data Liberation blog. I've downloaded my data in a huge ZIP archive that included all my Buzz posts saved as HTML files, VCF files for my Gmail groups and the first 100 photos from each of my Picasa Web album. What's the point of downloading the first 100 photos? looking at how hard it is to get your data off flickr... i was hoping that this was magically different. I think it is because for photos on Picasa Web Album, you can always download them through Picasa desktop software. If I remember correctly, however, only one album at a time is allowed? there is a "stream" service in the services tab. does anyone know what it is ? It look like it will be almost the same thing as the "wall" from facebook. So I have been trying to do this for hours. It gets to the "waiting" stage and never progresses. Neither account has that much data associated with it. Any hints? It's not the same. Google lets you download your Buzz/stream posts, but also other people's comments. When you export your circles/groups, Google shows a lot more information than just a name and a URL. it's ok now. I understand better "to differentiate from Facebook" in your post. Thank you for the precision. This seems to be interesting . gonna check out. Google Reader lets you export your feeds via OPML. Any plans to integrate this capability into Google Takeout? It seems much of the work is already done. Mail from Gmail can be downloaded both via POP3 and IMAP, so no need to add them to a zip file. Contacts can be exported via the Gmail-interface. when will Takeout include Google Docs and Gmail? Ninety-nine percent of my data is in those two services. Um, okay, so how do I *import* this data? What happens to the "download" section after the archives are completed? It shows a one week expiration date, but do they really clear out? Is there a way to remove them so there is no trace of having created them? Of the products listed, Blogger is not included? If it is there, hidden under a different name, does it backup all posts?